We Christians are often unhappy with our prayer lives – or so it seems. I hear this from friends, read it on blogs and have certainly felt it myself. We seldom feel like we are doing prayer “right” and we may even feel that God is as dissatisfied as we are. We cannot help but recall Jesus’ expression of disappointment with His closest friends in the garden, “So you could not keep watch with me for one hour?” (Matthew 26: 40). 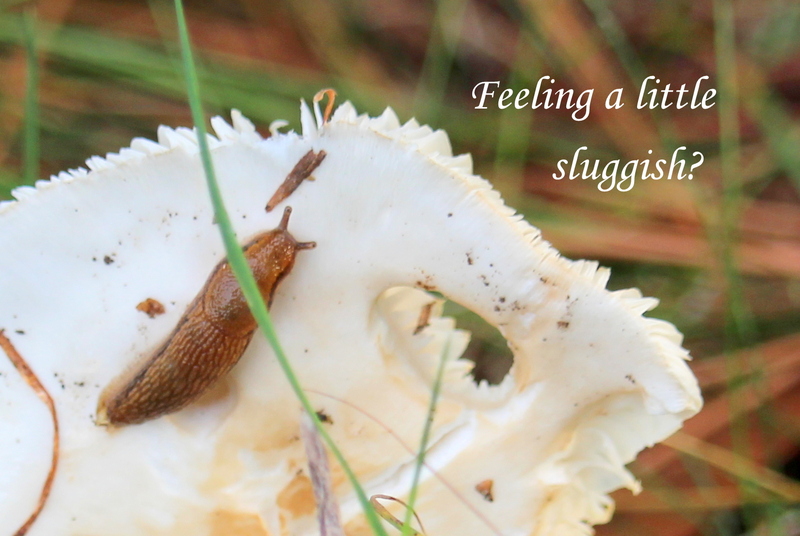 What does it mean to have a sluggish prayer life? Why does this happen to us and what can we do about it? I must admit this topic came to me in a rather humorous way. I recently returned from a weekend stay at the hermitage I frequent – where my spiritual life was anything but sluggish. Of course, the text was playfully added later. Last night, I was searching online for something a bit more inspirational to go with this photo when I happened upon a blog a deacon had posted on spiritual sluggishness. I decided to have a read. To be honest, I wasn’t particularly edified by the post. However, in my typical ridiculous fashion, I wrote a lengthy and ponderous response – only to discover that the site wouldn’t accept my comment! The slug is a slow-moving creature. Hence, our term “sluggish” is frequently used to describe a lack of activity or a feeling of lethargy, listlessness, weariness or apathy. Thus, the “sluggish prayer life” may be a state in which we have trouble getting ourselves to pray at all. Or when we do, our efforts feel sleepy and lifeless. We may say our prayers mechanically or start saying them and discover that we are thinking about something else altogether. We feel aren’t getting anywhere with our prayers. Certainly not closer to God. When this happens, we feel discouraged. “What’s wrong with me?” we ask. Should I try a different type of prayer? Maybe I need to be in a different posture or position. Perhaps I pray better alone, with others, in church, outdoors – anywhere other than where I am right now. If we are distressed that this condition befalls us, it means that, at some level, we want to pray. If we truly did not care about prayer, we would readily accept its absence or superficial production. So how is it that something I want to do so very much can elude me in the doing? Where does this sluggishness come from? Sadly, the sources of spiritual torpor are innumerable. However, to make consideration of them a bit more manageable, we might view them in terms of the basic aspects of our selves, knowing that these aspects continually interact with one another. So I begin with my body. Too much of this, too little of that and I am tired or lethargic. Illness or injury, major or minor, and my focus turns inward rather than God-ward. It is a capricious thing, this body. I often have no idea why it feels as it does. As trying as this can be, however, I do not believe that it is the primary culprit in my sluggish prayer life. And so I move on to my emotional life. If I thought my body was hard to understand and manage, certainly my psychological life is many times more difficult. In addition to all of the conscious thoughts and emotional reactions of the moment, there are many more reactions and memories stored in my brain outside of awareness. Some old memory may be causing a shut-down of response that I know nothing about. What I think is a simple stomach ache may be tension about the future that my organism is automatically anticipating. Dreadfully complex, but not likely to be the primary culprit either. And lastly, my spiritual self, undeniably interwoven with the physical and emotional fabric of my being. Sluggishness here emerges from many directions as well, ranging from demons to desires to distractions. With so many potential root causes, how might we ever find the source of our trouble so that we can address it? Pardon me. I had to take a break. I was growing tired and sluggish. How easily this happens. But what occurs to me is that this is not nearly as important as I imagine it to be. Of course, I can make it important – but it doesn’t need to be. If I have a good prayer life, it should feel gratifying to me. I will feel close to God. I will feel consoled and joyful when I pray. Praying well means praying with the frequency and in the manner of those whose holiness I observe and admire. There is such a thing as “a good prayer life”. There is such a thing as “praying well”. I can attain them if I work at it. Feeling sluggish (apathetic, tired, distracted, etc.) when I pray is bad. Particularly if I don’t feel that way when it is time to do other things. I’m so sorry. I must take another break. I have a dreadful headache. I will return, perhaps tomorrow. I’m back. My head is still grieving me over the sudden change in weather but, alas, such things happen. For now, I am interested in that first assumption. If I have a good prayer life, it should feel gratifying to me. I will feel close to God. I will feel consoled and joyful when I pray. Intellectually, I suspect that most of us can rather quickly identify this expectation as being without basis. Nowhere in the Bible or the Church traditions are we led to believe that the purpose of prayer is to make us feel good. There may be times when it does but this is a side effect, a blessing. It is not the reason we pray. In fact, great saints in both the Eastern and Western Church have documented for us how prayer can often become “arid” or “empty” as one moves more deeply into the spiritual life. So, at the very least, we should expect this absence of good feeling and sense of God being close. Perhaps we should even give thanks for it. So I wonder why we don’t. Why instead we pass negative judgment on ourselves. But let’s move on to our next assumption. Praying well means praying with the frequency and in the manner of those whose holiness I observe and admire. Upon closer examination, this too seems rather obviously misleading. No two people can have exactly the same prayer life. Even when the externals of prayer are uniformly shared as in a monastery, each person has an individual relationship with God within that structured prayer. What goes on in the heart of each monk is unique, not to mention what is said or pondered when back in his cell. Out in the world, our lives are so much more diverse that one person could not pray like another even if they made it their life’s goal. And to try , of course, would destroy the entire nature and purpose of praying. Relationships among people cannot be developed and maintained by imitating others. How can we imagine it would be so with God? And so it is curious that sometimes this is what we expect of ourselves – and what we imagine God expects of us as well. Yet a third most fascinating assumption awaits us: that there is such a thing as “a good prayer life” and there is such a thing as “praying well”. And I can attain them if I work at it. With the first two assumptions, I have been operating as though this third assumption were a given. But is it? Is there really such a thing as a “good prayer life”? Is it truly possibly for me to “pray well”? I am about to call these assumptions into serious question. “But certainly there is such a thing as a bad prayer life, isn’t there?” the reader might ask. So back to the assumptions. Since we have observed that prayer cannot be rated as “good”, either by noticing how it makes us feel or by comparing it with the prayer of others, how can we possibly ascertain if a prayer life, our own or another’s, is good? The notion of “praying well” is bound by the same limitations. While I might most enjoy the prayer that brings me a joyful sense of God’s presence, the prayer said faithfully through a time of darkness or intense struggle may well be the better prayer, both in the eyes of God and in its value for my soul. Yet another part of this third assumption is important to examine: that I can attain the good prayer life (or praying well) if I work at it. This is one of those notions that demonstrates the rich paradox of Christian spirituality. I will never grow in my prayer life if I do not work at it. Yet working at it will not cause me to grow or attain anything. So, no, I cannot attain this mythical “good prayer life” by working at it – but still, I must work at it. Apart from God, I can do nothing. And so I pray to be able to pray and trust in His promises. Ah – there is yet another assumption on the list, a fourth one: feeling sluggish when I pray is bad. Particularly if I don’t feel that way when it is time to do other things. Someone taught me a long time ago a simple but important lesson – that feelings are not bad or wrong. And I think that applies here as well, especially because this sluggishness that descends upon us is not voluntary. In most cases, what we do when we experience it is much more important than the fact of its occurrence. When I find myself in spiritual sluggishness, what then am I to do? I cannot, of course, come up with answers that can help every person under every circumstance – or that can even help me. But as I type here something is emerging, is it not? Assumptions about what is “good” prayer, the labeling of my current state as “bad”, all of these judgments have no place in my life of prayer. Yes, yes, of course, I am repenting. And to repent I must turn toward God. Unfortunately, the negative self-judgments and criticisms that sometimes pass for repentance often result in me turning my focus on myself instead of on Him. Let’s imagine the sluggishness of my prayer as though it were occurring in conversation with a good friend. My friend and I are talking and I begin to yawn, finding I can barely stay awake… What do I do? Well, this might depend on the circumstances. If it is late in the evening, I might say, “I’m so sorry, dear friend, I want to keep talking but I just can’t keep my eyes open. I must get to bed. Can we continue tomorrow?” I give them a hug and we go our separate ways. Soon I am fast asleep and hopefully my friend is not offended. I am genuinely sorry and try to repair the situation as best I can – but do not need to berate myself in order to repent. Similarly, I do not imagine that God wishes our repentance to consist of self-abasement as much as a loving movement toward Him. But what if our sluggish temper is such that we feel little motivation to pray? Does that not merit a sharp rebuke from within? Of course, all people differ in what motivates them but I personally think that the sharp rebuke is vastly overrated, whether in the context of raising children or trying to change one’s own behavior. At best, it seems that the offender’s attention is caught for a short time but soon it slips away again and there is a return to old patterns. Nothing has been learned on deeper levels. With both disorderly children and errant souls, certain practicalities such as routines are often helpful. However, in our prayer lives there is another dimension. We can bring anything to God. If I feel too sluggish or tired or irritable to pray, I can tell God that this is the case. After all, I can only begin where I am. And in the telling, I have actually begun my prayer. I may say more, I may not. I may ask Him what He would have me do, given this state that I’m in. If having no desire to prayer distresses me, this is not a sign of how “bad” I am. Rather it is a sign of a tiny little wish hidden deep within. And even the smallest, weakest desire to pray is a prayer. Wanting to pray is the soul calling out for God from wherever it may be – from darkness or light, from boredom or energy. The very weakest of desires may be little more than a groaning, barely audible, that the torpid soul lets out in response to the Spirit’s whisper. Little slugs that we are, we cannot tell if we are moving forward. And we should not try to. For we move “by faith, not by sight” (2 Corinthians 5:7). And God is in charge of our movement on the path. And He Himself is the Path. May I be content to remain on the Path forever, if He so desires, for He is my love and my hope. And my prayer is the journey, an unending journey into Him. *This comment is not meant to suggest that a gifted spiritual father/mother/director is unable to discern whether a person’s prayer is progressing as it should. Rather, it is assumed that their guidance comes from the Holy Spirit, not their own human understanding. This entry was posted in Uncategorized and tagged prayer, sluggishness on October 8, 2016 by mary.